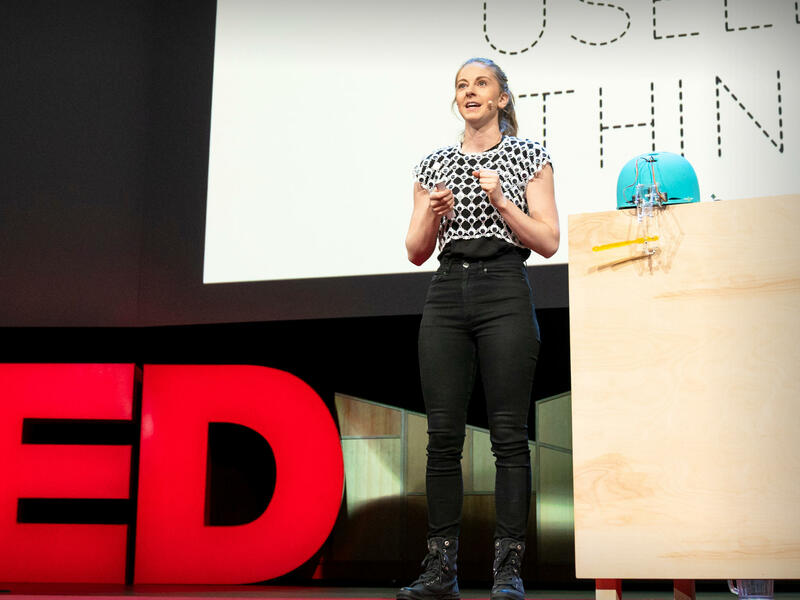 Simone Giertz on the TED stage. Part 1 of the TED Radio Hour episode Where Joy Hides. Simone Giertz is an inventor of useless robots. She finds joy and freedom in learning to build machines that are meant to fail. She shares that joy with millions through her YouTube channel. Simone Giertz is an inventor and robotics enthusiast, originally from Sweden. She began making robots in 2013, and two years later decided to start displaying her inventions on YouTube. Since then, Giertz has carved a small niche for herself as a "professional YouTuber." Her YouTube channel has over 60 million views and over 1 million subscribers. Giertz has also made videos for Tested.com, the technology news site and blog. She also co-hosted the Swedish comedy show Manick in 2017. It's the TED Radio Hour from NPR. Hi, Simone. Can you hear me? SIMONE GIERTZ: Yeah. Who is this? RAZ: This is Guy Raz. I'm the host of the program. GIERTZ: ...'Cause can I hear him, too. How are you? RAZ: I'm good. How are you? GIERTZ: I'm good. I just watched my TED Talk 'cause I was like, wait - what did I say now again? RAZ: This is Simone Giertz. GIERTZ: ...I think, in any language. I've just concluded that my ancestors were trolls. RAZ: And what do you do? GIERTZ: I run a YouTube channel. I'm an inventor of useless machines. RAZ: All right. So a little explanation. Simone builds these useless machines in order to teach herself about engineering and robotics. GIERTZ: I mean, generally, a useless machine comes from a problem. So I find a problem that I want to solve, and then I just go with the most kind of ridiculous way of doing it. RAZ: Now, the problems Simone works on are actually pretty simple tasks, like pouring a bowl of cereal or chopping vegetables. And Simone's useless machines - they usually don't work all that well. RAZ: Here's Simone Giertz on the TED stage. GIERTZ: As an inventor, I'm interested in things that people struggle with. It can be small things or big things or medium-sized things. And identifying a problem is the first step in my process of building a useless machine. For example, brushing your teeth - like, it's the thing we all have to do. It's kind of boring, and nobody really likes it. So what about if you had a machine that could do it for you? RAZ: Why don't you describe this thing that you showed to the audience? GIERTZ: This was the first kind of useless machine that I made. It was a helmet that had a robot arm on it just right on the top of it like a unicorn horn. And at the end of it, it had a toothbrush. GIERTZ: I call it the Toothbrush Helmet. And the robot arm kind of lowers the toothbrush in front of my mouth and brushes my teeth. GIERTZ: So my Toothbrush Helmet is recommended by 0 out of 10 dentists, and it definitely did not revolutionize the world of dentistry. But it did completely change my life because I finished making this Toothbrush Helmet three years ago. And after I finished making it, I went into my living room, and I put up a camera and I filmed a seven-second clip of it working. Since then, I've carved out this little niche for myself on the Internet as an inventor of useless machines, because, as we all know, the easiest way to be at the top of your field is to choose a very small field. RAZ: You spend many hours - days of your life making these useless robots. RAZ: No, no. No judgment. RAZ: It's just amazing. I mean, right? GIERTZ: Yeah. I mean, I do have to, like, have that conversation with myself. Like, can I really spend 14 hours on doing this? Is this really - does this make sense? GIERTZ: I'm almost 30. What am I doing? But, no. It is - it is joyful because I'm like, well, I'm creating something. My motto has kind of become, if I find it interesting, then there are probably other people who will find it interesting, too. RAZ: There's so much focus today on achievement and success that it's easy to lose sight of a simple emotion - joy. And joy isn't just this nice, pleasant feeling. It can actually lay the groundwork for a richer life and a deep connection with the world around us. So on our show today, we're going to talk about finding joy in some places you might expect, and in some places you might not. And if you watch Simone's videos on YouTube, it's not very hard to see why more than a million people subscribe to her channel, because Simone just shares her joy creating these machines - machines that have no real purpose. Can you just kind of describe a couple of other things that you've invented? GIERTZ: I think the machine that most people have seen that I've made is the Wake-Up Machine. And it's this alarm clock that has a big plastic hand on it and that slaps me to wake me up. I've made a plethora of other useless machines. More recently, I made a machine that serves me soup, and it kind of just throws the bowl of soup at me. GIERTZ: Hey, Google. Turn on the Soup Robot. COMPUTER-GENERATED VOICE: You got it. Turning the Soup Robot on. GIERTZ: I've also just - I mean, I'm doing a lot of different things. GIERTZ: What if you could have things orbit around your head like a personal delivery system? GIERTZ: The Hammering Robot is definitely more destructive than constructive. I think we need a little bit of iteration, but we're getting there. I think it'll work. This would be so much easier if I just knew what I was doing. Looking back, it's pretty obvious that I didn't have a game plan. I was just, like, skipping from one stone to another and being like, I'm going to try this, and I'm going to try this. I mean, engineering is so much about what the relationship you have to the tools you use. It's almost like a love relationship where you have to make sure that you use them for fun things as well to kind of keep yourself excited about it and to keep yourself engaged. At least that's how it's been for me. GIERTZ: I'm not an engineer. I did not study engineering in school, but I was a super ambitious student growing up. In middle school and high school, I had straight A's, and I graduated at the top of my year. On the flip side of that, I struggled with very severe performance anxiety. Here's an email I sent to my brother around that time. You won't understand how difficult it is for me to confess this. I'm so freaking embarrassed. I don't want people to think that I'm stupid. And, no, I did not accidentally burn our parents' house down. The thing is I'm so upset about is that I got a B on a math test. So something obviously happened between here and here. I got interested in building robots, and I wanted to teach myself about hardware. But building things with hardware, especially if you're teaching yourself, is something that's really difficult to do. It has a high likelihood of failure, and moreover, it has a high likelihood of making you feel stupid. So I came up with a setup that would guarantee success a hundred percent of the time. And that was that instead of trying to succeed, I was going to try to build things that would fail. And even though I didn't realize it at the time, building stupid things was actually quite smart because as I kept on learning about hardware, for the first time in my life, I did not have to deal with my performance anxiety. And as soon as I removed all pressure and expectations for myself, that pressure quickly got replaced by enthusiasm, and it allowed me to just play. RAZ: I mean, it strikes me that on the one hand, you could describe this as, there's Simone. She's making useless robots. Right? But on the other hand, like, this is something that brings joy to a lot of people. People love watching this because it's really funny. Is there part of this idea that you just want people to laugh? GIERTZ: Yeah. Most definitely. I mean, at least for me, that's always been how I justify taking up any space in the world. It's with a punch line. But to me, it became this, like - engineering is really intimidating. And trying to set out to learn about engineering, especially if you're teaching yourself, like I did, it's just such a daunting process and made me not want to go in and learn about it 'cause I was really scared to be questioned. So building useless machines, for me, started as, like, kind of a cathartic, just, like, I want to learn about engineering but I don't dare to actually try to make it in a serious way so I'm just going to build things that fail. RAZ: You know, I mean, like, most of us were sort of trained to believe that a life of purpose and meaning requires goals. Like, building a career or creating community is, like, something very concrete, and that's what gives us meaning. But it strikes me that that's actually incomplete, that there are things, there are pursuits without a goal, like, just purely because they're fun or joyful that are just as meaningful. You know what I mean? GIERTZ: I also feel like creating things doesn't have to be much more than that. And there is definitely a lot of joy to be found. It's just that there's so much else getting in the way. And we live in a time of distraction. I've just started just thinking about my phone. If my phone would be a person then it would be the biggest jerk of all time 'cause whenever you're, like, with family, or you're trying to relax or something, it would just be that friend who comes and, like, taps you on the shoulder. And it's like, hey, I got something. Yeah. You really want to see this. Come. Just check this message. So we're constantly just being so distracted by things. And I think that is the biggest joy killer, at least for me. And just making things is such a good counterbalance to that. GIERTZ: So as much as my machines can seem like simple engineering slapstick, I've realized that I stumbled on something bigger than that. It's this expression of joy and humility that often gets lost in engineering. And for me, it was a way to learn about hardware without having my performance anxiety get in the way. And I often get asked if I think I'm ever going to build something useful. But the way I see it, I already have because I've built myself this job. And it's something that I could never have planned for. Instead, it happened just because I was so enthusiastic about what I was doing and I was sharing that enthusiasm with other people. To me, there's the true beauty of making useless things. Because it's this acknowledgement that you don't always know what the best answer is. It turns off that voice in your head that tells you that you know exactly how the world works. And maybe a toothbrush helmet isn't the answer, but at least you're asking the question. Thank you. RAZ: That's Simone Giertz. You can find all of her videos on YouTube, and you can watch her entire talk at ted.com. Transcript provided by NPR, Copyright NPR.